Oral history can be a tough genre to enjoy; it is by nature disjointed and often suggests an author is lazy. In the hands of an experienced pop and jazz journalist like Marc Myers, it is one way to bring together various elements from what often is a group effort involving singers, instrumentalists, producers, and recording engineers. 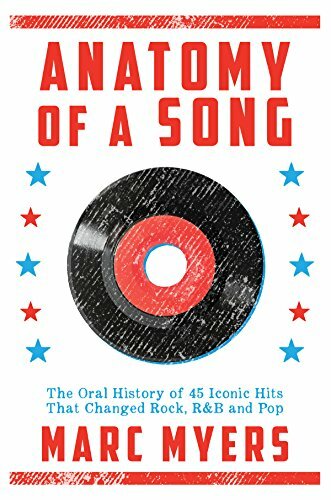 This book examines the backstory behind some of the greatest hits in rock music history from the 1950s through the 1990s, a period awash in non-hip-hop nostalgia. Such a repetitive idea becomes meaningful only when a particular song has an established place in a reader’s heart. That surely will be the case among rocking boomers for whom this collection is the soundtrack of their lives. Anatomy of a Song does not need to be read sequentially; dip in wherever you see a tune that appeals, and you won’t be disappointed. These song biographies began as a series of newspaper pieces that Myers published in the Wall Street Journal. The problem is that to achieve some book-like coherence, he tries to frame the tunes by introducing them in terms of where they stood in the history of pop music. It works early in the book, which begins with 1952’s “Lawdy Miss Clawdy” sung by Lloyd Price, among the earliest R&B/Rock ’n’ roll hybrids. Myers is very good in discussing the difference between male and female singers and groups of the 1950s. He spotlights the crucial role of Phil Spector on “You’ve Lost that Loving Feeling;” and he establishes Motown as the essence of the crossover black hit factory, where singers were assigned songs written by others. Among the best “anatomies” is that of Joni Mitchell’s “Carey,” from the groundbreaking album Blue, among the greatest long-form autobiographical albums by a female songwriter. Myers’ playback of the Mitchell interview becomes the story of one enormously gifted artist as in flight from countercultural celebrity. While on a faux hippy escape from the music scene in Southern California, Mitchell describes how she met the real Cary while attempting to hide out in the caves at Matala on Crete. Her introduction (she was running away from her chronic problems with men) will make Mitchell’s admirers long for her memoirs so we can learn the genesis of all her songs that reference famous lovers such as Leonard Cohen, Graham Nash, David Crosby, James Taylor, etc. Not content with her explanation of the real life Cary Raditz (the only thing she changed was the spelling of his name), Myers tracks down Raditz and interviews him, too. There is even a snapshot of the two of them together, in Greece, back in the day. Using a classic song from a classic year (1971) the section encapsulates that era’s casual way of living and the rock n roll that defined it. There are other platinum tales here. Did you know that John Fogerty deliberately borrowed the lead chords of “Proud Mary” from the first notes of Beethoven’s “Symphony No. 5?” (Play “Proud Mary”’s beginning and you’ll catch on immediately). And that Janis Joplin based “Mercedes Benz” on a poem of beat poet Michael McClure? Yet how can he omit the masters? Anyone’s set of milestones, however subjective, surely would include Bob Dylan, Lennon and McCartney, Pete Townshend, James Brown, Bruce Springsteen, Paul Simon, the Beach Boys, Johnny Cash, and Carole King. Not one of these is represented. Myers continues to write about pop classics In the WSJ using a different approach. His recent interviews show how specific hits impacted young, later very successful, individuals in various fields. This is surely fertile ground for a future book that includes the masters.